New York is “so good”, they say, they named it twice. Well, we think Digital Identity is such an important issue for the UK public – and private – sectors that we’ve decided to programme an unprecedented two events on the topic in the same year. So while you came along in May for the first ‘half’ of the best UK conference on Digital Identity, schedule as soon as you can Thursday, November 29th, in your work calendar – as we have a new, extended day for you to get value from. 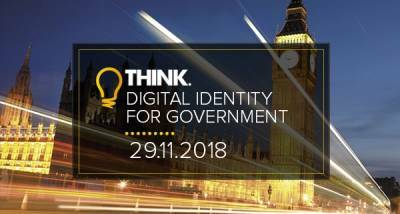 That’s in the shape of Think Digital Identity for Government 2018, which has a specific focus this time on ‘Understanding the Policy, Practice and Delivery of Public Sector Identity’. Again timetabled to take place at highly-convenient Westminster conference venue One George St (nearest Tubes Westminster/St James’s Park), the already densely-populated agenda shows how all the salient discussion points around Digital Identity, from how to create viable ecosystems to the contribution of blockchain to the real future of GOV.UK Verify – have been addressed by the conference organisers. The credibility of the event is again underlined by the high quality of its sponsors, which include the Government Digital Service, Identity industry group the Open Identity Exchange (OIX) and non-profit Identity consortium the Kantara Initiative. Even at this stage, we can also confirm some excellent, relevant speakers, from both central government Identity heavy-hitters and practitioners to highly-informed industry players, including representation from HMRC, DVLA, the BBC and others, including experts from analyst group GlobalData. Chairing the event and ensuring both smooth running on the day and insightful questioning of speakers at every stage is well-known independent public sector IT commentator and Editor of Government Computing, David Bicknell. “It’s said that time waits for no man,” says Bicknell. “Well, nor does the policy, technology and implementation of Identity in public services. “Six months on from our well-received conference in May, this time we’re providing day-to-day examples of public sector identity being delivered at the sharp end in Departments, agencies and the wider public sector. And for organisers Think Digital Partners, the reason for a second Identity event is clear – it’s what the community wants. “After the success of our inaugural Digital Identity conference, our delegates asked for more real life examples and that’s what we want to bring them,” confirmed its Director, Matt Stanley. Think Digital Partners also says even though the event is still a few months off and it’s mid-Summer, registrations are already coming in and at least 250 public sector delegates from across central and local government are expected on the day. If you’d like to hear more about the commercial side of opening a dialogue with those attendees or supporting the show in other ways, email Matt here. But it’s really for you, the practitioner, to come and hear the latest about Digital Identity in the public sector, so we invite you to secure your place well in advance by going here [http://www.thinkdigitalidentityforgovernment.com/register/] – and, as with all Think Digital Partners events, your place is FREE if you are a qualified public sector professional. Think Digital Identity for Government. Something all of us – right across society – will be doing a lot more of in the years to come. So clarify your thinking – and your strategy – as soon as you can.